Surrounded by Booderee National Park and the pristine blue waters of Jervis Bay, litterally lapping at your doorstep, this residence constructed by Munio Group takes full advantage of bringing the outdoors in. To help ground the dwelling into its setting Stonehedge was commisioned once again by Munio to build several features from sandstone including Feature columns, 2 handcrafted fireplaces and extensive sanstone tiling. The result – A great mix of quality materials that work together with its surrounding landscape and unobtrusive in its new environment. The use of sandstone columns throughout the building provides a balance of materials and aids in tieing all the stonework together. 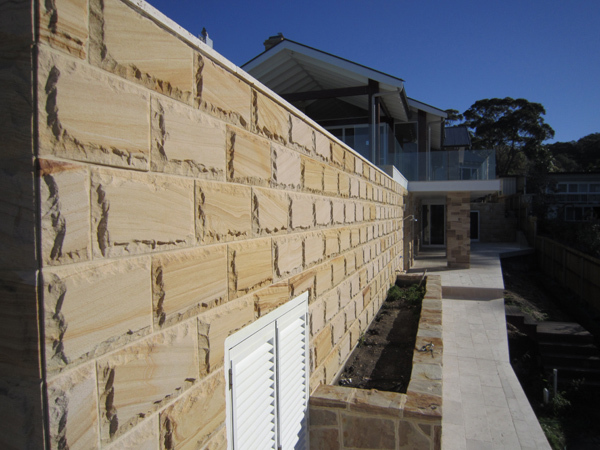 When it comes to stonework, Stonehedge are our first choice. Working previously with the Stonehedge team on a residential build in Kangaroo Valley we set a new challenge for them at Hyams Beach, the hand crafted fireplaces – a stand out feature. What we enjoy most about Brett and his team, besides their obvious skills with stone, is their even temperament and ability to work side by side other tradesmen on what can sometimes be a difficult site for a team of stonemasons.